It appears that the New Haven RR Hudson River Bridge at Poughkeepsie is now "up and running". The Henry Hudson anniversary sparked many plans for legacy projects, many of them - including land purchases as a bulwark against view-destroying sprawl - still unrealized. Maybe as the economic and aesthetic benefits of this once-dreamy, impractical vision - saving and fixing a big old bridge - become clearer, people will summon the will and means to dream even bigger. Two weekends ago, I was "out" for a family wedding. On approach to HPN Runway 16 Friday, from a good flightseeing seat, I saw the Bridge. While in all likelihood it was simply the sun, "I'd swear" the Bridge had been painted Silver!!! 1. you show a gap in the Greenway trail between the airport and Genesee Junction. I understand why the gap is there..its because the trail is not along the railroad bed for that stretch..
two points, when in fact it does..the Greenway trail is continous through there, just not on the actual PRR ROW for that "gap"..
do not follow the old railroad ROW? just so the entire rail-trail is shown? I would vote yes..just so the full trail is on the map. and that trail should also extend all the way up into downtown Rochester, to Court street, on the west side of the river. but its all one continous trail today, just two different railroads..
2. What is the trail from Scottsville to Garbutt? the only railroad through there is the original BR&P..still in use by the Rochester & Southern railroad today. Is this technically a "railtrail"? was this an old Gypsum mine spur off the PRR or something like that? I am not familiar with this line..
scottychaos wrote: Great map Russ! Absolutely. That map is produced from my map of all railroads. I've found other difficulties with that format, so I've switched from my own data format to http://OpenStreetMap.org/ . It lets me mark railroads as rail-trails and also mark non-railroad segments as connecting paths. Plus I can connect switches, branches, and spurs so they're connected, and not just near each other. Yup to that also. If you look on OpenStreetMap, it should be there now. If it's not, you might want to add it in yourself. There's a bit of a learning curve to using the OSM tools, but you can make some nice maps. And then you can search them, so for example, I know that there are about 360 abandoned railroad bridges in New York State (30 of them in Rochester!!). Yeah, that was an artifact of how I had entered the GVG. As you say, it's not a trail at all. I've since fixed it on OSM. When Gov. Andrew M. Cuomo recently announced a plan to create the longest multiuse trail in the country, Mr. Burns and other outdoor enthusiasts cheered. His bike store sits next to the Putnam County Trailway, which will be incorporated into Mr. Cuomo’s plan for a 750-mile Empire State Trail. “It’s a great idea,” Mr. Burns said. “It is very safe and very well used. For myself, I haven't been on a bicycle since college. I'm afraid to, and when I was a teen, it "was square" to be seen riding one. 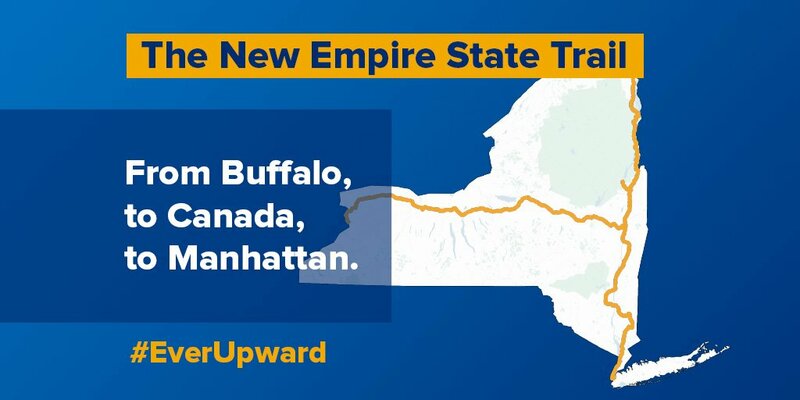 Today, Andrew Cuomo announced the Empire State Trail. It is to be a trail from lower Manhattan to Buffalo and to the Canadian border at Rouses Point. I'm wondering what the routing will be. Scant details are available. Cuomo claims that it will link 40 trails and "all be done on land we already own." This is the only map I've seen so far: https://pbs.twimg.com/media/C10kC0oXUAAJp0r.jpg . Some of these are *definitely* abandoned railroads. Other parts can only be rail-with-trail. o Note that he said "link", not "use". Won't need 40 trails. o The Hudson River Greenway -- runs along the west side of Manhattan. o ? Have to jump from Inwood Hill Park to Van Cortlandt Park. 2 miles as the crow flies. o The Putnam Branch, which is now a trail from Van Cortlandt Park to Brewster. o The Beacon Line with a trail alongside? Or scrap the Beacon Line? Anyway, the map shows it used. o The Dutchess County Rail Trail in its entirety. o ? Have to jump from Lloyd to New Paltz likely using the NY-299 right-of-way. 4.6 miles as the crow flies. o ? My guess is they cross to the east side of the Hudson at Kingston. o ? I have NO CLUE how he expects to connect from Kingston to Albany. My only guess is rail-with-trail along the Amtrak / Metro North River Line. The trains go fast, but there aren't many of them once you get north of Poughkeepsie. o Looks like they're going to cross the Hudson on the Castleton-on-Hudson bridge used by I-90. o ? No idea how they'll get from Selkirk-ish to the Port of Albany, which is the southernmost end of the Canalway Trail. o Once they're on the Canalway Trail, there are a few gaps that just need money and cooperation from CSX, which owns some critical bits of the abandoned West Shore. o and then there's Syracuse which is a big podge of ick (as far as disused railbeds go -- they've all been built on). o Back to Albany, you can head north on the Champlain Canal towpath or the Old Champlain Canal towpath, as needed. Some parts are a trail already. o Mechanicville is another podge of ick, but much smaller than Syracuse. Halfway between it and Stillwater is the Stillwater Multi-Use Trail, the former Stillwater Branch. o Back to the Old Champlain Canal Towpath. o Schuylerville is actually fairly non-icky. There's a towpath trail up to Lock 5, then a closed road to cross the Hudson. o Follow the Old Champlain Canal Towpath to Fort Edward. o Old Champlain Canal Trail, with a connection to Lake George via the Feeder Canal Heritage Trail and Warren County Bikeway. o ? I wildly wave my hands at Whitehall and mumble "rail with trail" to Canada. I was thinking about Syracuse. Maybe they could convince CSX to let them build rail-with-trail, just to get around Syracuse? After all, they're going to be paying CSX millions to get the West Shore. Russ, what bike do you use for your rail-trail riding? I have an old Panasonic touring bike with V-brakes, bullhorn bars, 38mm 700c tires, full fenders, running only a rear derailleur with 6-sp freewheel (I have several old 6-sp road freewheels, with plenty of extra cogs to make custom gearing). I'm also a road cyclist, so I occasionally take at least parts of rail trails, but mostly stick to pavement with those. Yes, rail-with-trail. They plan to relocate the line from one side of the dual-track ROW to the other as needed. Looks like on roads between south Kingston and Hudson, then on a brand-new rail-trail from there to Rensselaer. Nope, probably the US-9 bridge. It will be a trail on the shoulder of the highway. The Streetview shows it, NE side of the roadway, as a dirt path, but right up until Thanskgiving 2018, construction was happening, including drainage, path title signs, and Yield signs for roadway motorists. The paved path I believe heads to at least Lockport Road, although this article https://www.lockportjournal.com/news/lo ... bc445.html has a quote from a resident from the next street up on Murphy road. This post may be a bit premature, as the Google Street View pics are old, as is the article (pre construction), and I haven't actually seen the NE end myself. There are still rails in the ground at the crossing just north of NY SR 93, and on the SW ROW, there's still former/current industry property so the Hinman Road area may still be out of contention for this. But the path looks like a great cut off to the North Tonawanda area from having to bike the Erie Canal path. I used to live in the Town Of Tonawanda right near the newly opened E-L RR ROW Rail Trail and there's a bunch of remaining evidence of the former E-L and electric commuter rail on it (from the north end straight into the city of Buffalo).